Yes, it's a brand new Cats thread! Should I rescue a stray cat on holiday? Have you ever eaten out in a sunny country only to be greeted by a mewing, skin-and-bones cat? Which, by desert, has worked its way into your heart, leaving you seriously considering adopting it and taking it home? No? Then this article is probably not for you. Yes? Then you will empathise with Ali Gill, a British holidaymaker who this summer spent £1,000 and two months re-homing a starving kitten she met on the Greek island of Tilos. Stray, pitifully hungry cats are a common sight on Greek islands. But are holidaymakers’ whims of “rescuing” them to be encouraged? Or even practical? Ms Gill’s commendable efforts to find a better life for “Squeak” – an undeniably cute silver tabby with only half a tail and an injured leg – began by feeding the “plucky” animal titbits. According to a report in the Daily Mail, she decided to save him after hearing how, come winter, the island’s cat population drops substantially when the summer tourists head home. There were even scare stories a few years ago about cats in Corfu being poisoned once the tourist season was over. After trying unsuccessfully to find a home for him on the island, she phoned around for advice and found Airborne Pets, who told her that cats can only be transported from Rhodes to the UK in the hold of the plane. The fact that the flight would cost her between £540 and £680 did not put her off. Added to this were vets bills for a microchip, inoculations and a pet passport, flea and ear mite treatments, a ferry ticket to Rhodes, an airline-approved crate and three weeks in kennels before the kitten was given the all clear to fly. A taxi driver had to drive Squeak from the kennels to the airport, as Ms Gill could not stay and wait in Greece. With the British love of pets, and holidaymakers becoming attached to stray cats on islands in Spain and resorts in Turkey too, controls on bringing animals back into the UK are strict. For entry without the need to be quarantined, dogs, cats and ferrets must also receive a rabies vaccination followed by a 21-day wait before entering, according to the Home Office. They also need to be microchipped (you must make sure the animal has the microchip before the rabies vaccination, otherwise the jab won't count), have a pet passport, and to travel with an authorised transport company on an authorised route. The Government list of approved routes by sea and rail can be found here and by air here. It is normal practice for the airline to cover flight and UK handling charges in their pet ticket price, the Home Office advises. You may wish to check this when making your booking. No charges are made by Defra, the food and rural affairs ministry. Dogs also need treatment against tapeworms at least 24 hours before the flight. Vets are required to adequately record these details in the pet’s passport, or, if outside the EU, through an official veterinary certificate. The transport company may also require a vet’s certificate stating that the animal is fit to travel. Pets cannot travel in cabins, should not be sedated and should not become stressed during the flight, with the IATA Live animal regulations ensuring that all animals that travel by air do so in comfort. Companies such as Airborne Pets (airbornepets.com), used by Ms Gill, can provide a full import process for pets, including the necessary UK import paperwork. The final thing to remember is that, once they get here, those kittens will need looking after for an average of 15 years, or longer if they are lucky enough to live to the age of the world's oldest cat. Poppy died aged 24 in Bournemouth this June. Right, now I can go around and nail up all the cat-flaps in the other threads! Reminds me of the well chronicled "holiday romance". A Russian bank is giving free cats to people who take out a mortgage. Sberbank, one of Russia's biggest lenders, is offering customers a choice of 10 felines, which will be delivered to their home. The bank's website features 10 breeds, including Toffee, a siamese, Timothy, a tabby, and Kuzma, a Sphynx. Sberbank's advert features two van drivers handing over a white cat to an excited couple who have just bought a home. It also shows the couple in a branch talking about a mortgage with a bank employee who is surrounded by cats. The deal is then sealed with a fist-bump. The move is an attempt to capitalise on a Russian superstition that a cat entering your home first is good luck. However, homeowners are only allowed to keep the cat for two hours. They must also sign an agreement promising they will not harm the animal and freeing the lender from responsibility for any possible catastrophe. Sanctions against Russia in retaliation for the Ukraine crisis have hit the country's lenders hard, as they are denied access to borrow on Western financial markets. On Tuesday, the Russian government approved injecting 239bn roubles (£4bn) into VTB Bank and Rosselkhozbank. I've bought a couple of new houses on fledgling estates and I swear kittens appear through the letterboxes of new homes over here. And the last house I rented was infested with panda cubs in the cellar. I swear I had to drown about 250 of them to fix the infestation. You can download a free interactive ebook Guide to Your Cat featuring analysis, advice and case studies from the series. The BBC is working with the Mammal Society to map the distribution and density of cat populations across the UK. To take part in the survey, visit the Mammal Society website and fill in the online form. I am currently owned by two cats and I'm sure they'll let me watch it. well he's so furry and folds his paws and.... it's not in me to disturb him! Two of my older cats have taken to living in the front garden for the summer. I think they've fallen out with the younger cats. The 'outside' cats visit a neighbour for treats and fusses. He is disabled and a widower and he loves the cats. Yesterday I popped in to see him and my two old cats were both there, eating sliced chicken and cat food. They greeted me politely then went back to their munching. I don't have a cat. I love them. But I just know that if I got one, it would hate me and the relationship would be 'let me out in the morning...feed me when you get home... bite and scratch you... see you in the morning and there better be food ready'. Missing cat Jack has been reunited with his Sherborne owner after a two-week ordeal - thanks to a Blackmore Vale Magazine reader. Liz Burt mounted a major search for her friendly tabby cat. But the days turned into weeks without a sign of him - until Sherborne businessman Mike Riley spotted Jack’s picture with a story in last week’s magazine. He remembered seeing a tabby cat near his Riley’s Cycles premises in Trendle Street, not far from Jack’s home, before locking it up for a fortnight. Liz said: “He rang me on Friday evening and didn’t sound very hopeful. “He had gone back and unlocked the barn and called for Jack but there was no sign of him. “But that was the best lead I’d had so we went round and Jack came out when I called his name. “I think he’d been so frightened after so long that he wouldn’t go to Mike. “I was in tears when I saw him. It’s absolutely wonderful to have him back. She added: “I was going nearly frantic looking for him. It was like a black cloud over everything. “I walked miles and drove miles and yet I felt he probably wasn’t far away. “I didn’t realise that place was locked up - I thought people were going in and out of everywhere in Trendle Street. “When Mike rang I was too scared to be hopeful that it was Jack. “We had put it on Twitter and facebook and had fliers out everywhere. Jack returned home to a double celebration. The call had come in the middle of a family get-together to celebrate the birthday of Liz’s fiance Clive Farrant. I thought he was reading the Blessed Virgin Mary! With a relentless look of malevolence “Grumpy Cat” is not exactly cute. But the piercing stare and air of withering contempt has proved astonishingly lucrative for the cat’s owner, Tabatha Bundesen of Morristown, Arizona. In just two years the cat – whose real name is Tardar Source – has made £64 million from an array of products, including bestselling books and a film. Not surprisingly Ms Bundesen believes her pet is “unstoppable”. She told the Express: 'What she's achieved in such a short time is unimaginable and absolutely mind-blowing. I'd love it if we had bus cats..... stress relief and something warm! 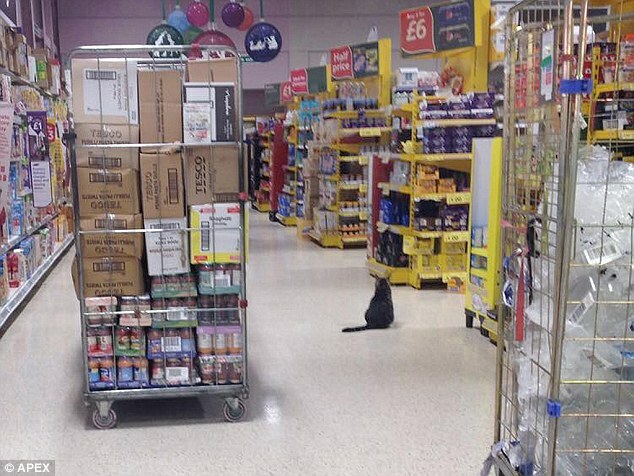 Mango the cat who has adopted the local Tesco as his second home. 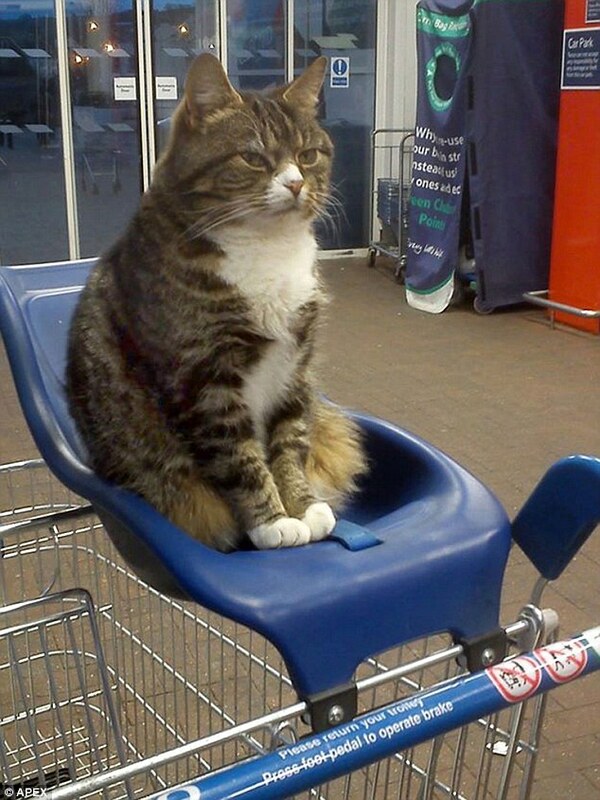 A tabby cat which made his local Tesco store his second home has become so popular his fans and admirers have set him up with his own Facebook page. Mango has become a huge hit with Tesco customers in Tiverton, Devon after setting up house in the store's foyer four years ago. Tabby Mango spends much of his time sleeping in the foyer or curled up on the store's entrance mat, although he's not averse to taking a stroll in the other departments. But he's so well loved he has his own dedicated Facebook page set up by an unknown customer to give his fans an outlet to share their love - and it already has more than 2.500 'likes'. Having a spot of bother with our cat Moo one of 5. She and her sister were completely feral as kittens and a friend that runs the local cat sanctuary said the pair would be untameable which I took as a challenge, so I adopted them. Cut a long story short 12 years later the pair have turned into adorable fat lap cats. They love me and my wife but will scarper if anyone else around apart from one family member who lived with us for awhile while he was getting back on his feet. We had to take Moo for her check up to the vets. She's had numerous issues as she has a thing for grass and has had to undergo surgery for it. She has dealt with this with a great deal of bravery. We usually keep her in a room at night before a visit to the vets. She is normally fine and is back to normal after a visit apart from this time. When she got back she was fine but after a few days she now runs away from me and my wife. She will sleep on our bed at night, but will avoid us during the day at all costs - Even missing out on food, which for Moo is unheard of. I'm taking it very easy with her, she is obviously very anxious and I have no idea why. If she has been spooked by someone I'm at a loss as to why she has transferred that fear onto us. She is fine with the other cats. Will occasionally let us pet her and is improving, but it's unsettling that someone has made her so fearful as she never wanders from our house and garden and I don't recall anyone being around. The other cats have no issues and are their normal selves. I'm often at home during the day and just leave a couple of doors open and she often sits on the patio watching me and is letting me get a little nearer each day so it's just a time thing. I don't make a lot of eye contact and often will sit down which seems to make her less anxious. It's sad though when one of your kitties is so unhappy. One of our cats did the same thing after she was spayed - from her point of view, we took her somewhere, she went to sleep, when she woke up she had a shaved patch, a big cut with stitches and I'd imagine some pain. I'm guessing she was blaming us for it so avoided us, but after a few weeks she was fine.